There is always something happening in supermarkets - new products, product demonstrations, shelves reorganised so you can't find anything. Not always interesting, quite often boring and sometimes a chore but just occasionally something catches your eye, something is interesting . . . It is funny how something triggers off a memory. In this case it was chocolate. 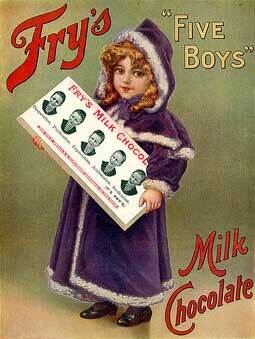 Does anyone remember Fry's Five Boys Milk Chocolate? 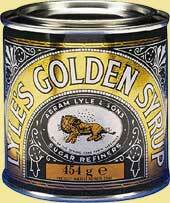 It was discontinued in 1976 but in its day it was one of the most popular chocolate bars. Probably because there was not the competition or quality of today. And my memories? When my age was still in single figures, back in the 50s, every Thursday afternoon my mother would take us, borrowing the car from my father, to visit our grandmother on her small-holding. When the visit was over, without fail, my brother and I would each be presented with a bar of Fry's Five Boys Milk Chocolate and sixpence pocket money each. We thought the chocolate was wonderful so what would we have thought of today's offerings. One particular brand of chocolate has always been one close to my heart from early family holidays to France when the big treat was to buy a bar of Lindt chocolate . . . they were twice the size of what we were used to and the taste was far superior. There was magic in the Lindt chocolate, probably because it was something we could not get back home. As children what would we have made of the range of Lindt chocolate which graces the modern supermarket shelves. I suspect Yuk might have been my first reaction as dark chocolate is a taste I have acquired with age. As my chocolate tastes have changed I have found myself becoming a chocolate snob and any old chocolate will not do, especially milk chocolate. 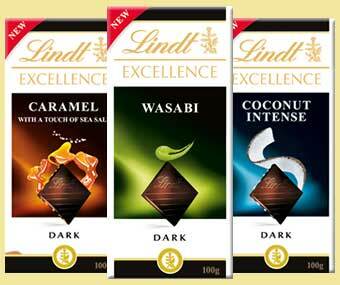 The Lindt tasting did not cover the whole range but certainly a good cross section, including the new flavours of Dark Wasabi (yes Wasabi), Dark Coconut Intense and Dark Caramel and Sea Salt. Along with these I chose Dark Chilli and Dark with a Touch of Sea Salt to complete the tasting. Additionally I have some of the Dark High Cocoa Percentage bars to try but these are for cooking rather than popping straight into the mouth, and at the moment I have not found time or a recipe to try but will come back to them at a later date. You should be warned, try any chocolate from the Lindt range of dark chocolates and you will be hooked on dark chocolate. Try any bar in the range, leaving a piece of chocolate to melt slowly on your tongue, and you are guaranteed a Mmmmmmmm! moment. They are all good, they are all interesting but depending on your tastes some are better than others. Of the three new flavours the Dark Caramel and Sea Salt is the one I liked most. The Wasabi was a very strange combination and perhaps demonstrates how versatile chocolate is. I did not dislike it but was left puzzling whether I did or did not  the jury is still out, although it may well be one that grows on you. If you like coconut this was a really good coconut and chocolate hit. I did enjoy it but a youthful over indulgence in Bounty bars has left me still avoiding anything with coconut in it . . . I do intend to try some more though! For me the greatest and most pleasant surprise was when I first tasted Dark with a Touch of Sea Salt. My initial thoughts were what a strange combination but as it melted on my tongue . . . words fail me. 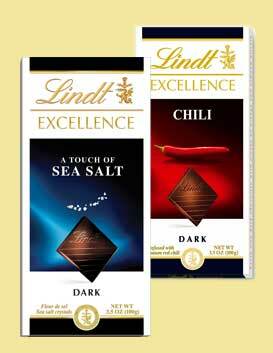 Out of this world and if you have never tried a Lindt Dark chocolate you must at least try this one. The Dark Chilli runs it a close second. The Lindt Dark chocolates are a real quality range and I would highly recommend them. Oh, I forgot I did not like the milk chocolate but who would, once hooked on the Dark side! And the good thing is they are all available on the supermarket shelf. Editorial note: This site is not paid to promote any of the products or places featured in this newsletter. Spanish ham tacos can be achieved from both the Iberico and Serrano ham although from the latter is much more common and readily available. Tacos from the Serrano ham can actually be cut during any stage of the carving, tacos are similar to diced ham but larger making them great to lightly sprinkle over salads, stuff mushrooms or chicken breast and to cook with. Tacos will become crisp when baked or fried and they are a firm favourite in Spain being lightly fried in olive oil before being patted dry then sprinkled over pumpkin soup. Tacos can be served raw or cooked and add a lovely Spanish flavour to all types of chicken dishes, soups, casseroles and other Spanish meals. Fresh tacos are easily achieved from either a full leg of Serrano ham or if you have a smaller boneless ham or ham piece. Simply carve one thick slice which should be around 3mm thick and then chop into small cubes. Fresh tacos like this are best served cold as the meat is moist and less chewy. One handy tip for carving tacos is to slice from around the protruding hip bone which will eventually be encountered while slicing your ham  try to avoid carving a curve into ham but if you find yourself doing so you can straighten up by carving shorter thicker pieces from near the bone. 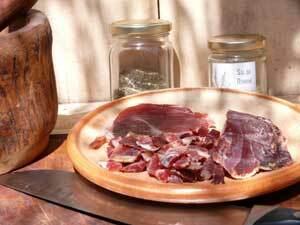 Another way of achieving tacos is from those hard to reach areas of the Serrano ham such as around the hip joint. There are places in a Spanish which require the use of a small boning knife and these areas are usually left until last. Instead of wasting the last of the meat you can carve out small pieces and be surprised how much meat is still left on that leg! Ham pieces such as these can be cut into tacos and used in cooking, if the ham is old (ie been cut into a month or so prior) then your tacos may be quite hard  these are ideal for cooking with especially in casseroles where the meat will soften in the juices or sauce. This recipe from Natoora for Rainbow Trout with Pickled Cucumber is another simple but tasty way to cook trout. *The Sicilian cucumber is miles ahead of the supermarket version. Firm, cool, and slightly bitter to the taste it is perfect for so many dishes. Do not worry if you cannot get hold of it as any cucumber will do. 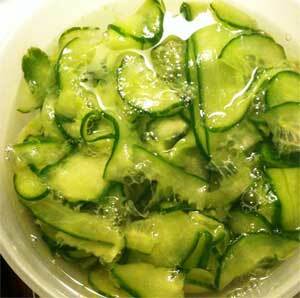 Peel the cucumbers and slice thinly. Sprinkle with the salt and mix well. Leave for 10 minutes, then rinse with cold water. Drain any excess liquid, then return to a large bowl. Grate the ginger and finely chop the dill. Mix with the sugar and vinegar, then add the cucumber and mix well. Refrigerate for at least 3 hours before serving. Season the trout with salt and pepper and place on some tin foil, leaving enough to wrap the fish. Add a small knob of butter to the top of each fillet, and some slices of lemon. Add a dash of white wine and seal the foil packets. Bake for 8 - 10 minutes at 180°C. Flake the trout and serve hot or cold with the pickled cucumber. Place smoked haddock in the milk by bringing to the boil and poaching. Take off the heat and leave the smoked haddock in milk to infuse for at least ten minutes. Remove the fish from the milk and take off skin. Break the fish into big chunks and set aside. Put onions, garlic and olive oil in a sauce pan, season and cook gently until soft and translucent. When the onions are soft, add the peas, all the milk and some chicken stock. 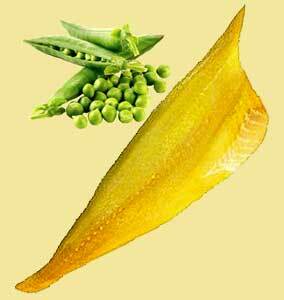 Bring back to boil and simmer until the peas are cooked. Use a blender or a hand blender in the pan to make the soup smooth. Taste and check the seasoning as it will need some salt as the peas will make it sweet. Pour through a sieve back into the pan. Bring back to a simmer and add some chicken stock to get the consistency you want. Put a piece of smoked haddock in each bowl. Cover with grated cheese and pour soup over so that the smoked haddock is covered. Add a swirl of cream if you want and some chopped chives. Grease a 900ml (1½ pt) pudding basin. Put the syrup in the bottom of the basin. In a bowl, cream together the fat and sugar until light and fluffy. Add the beaten eggs, a little at a time and beat well after each addition. Using a metal spoon, fold in half the flour, then fold in the rest, adding sufficient milk to give a dropping consistency. Spoon the mixture into the basin, cover with greased greasproof paper or foil and secure with string. Steam over a pan of boiling water for about 1½ hours until well risen and firm to the touch. How to tell how fresh fish is? 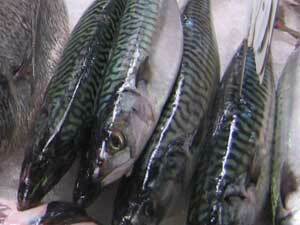 With filleted fish it can be very difficult, one must rely on your sense of smell and touch. When lightly pressed the flesh of fresh fish should be quite resilient and bounce back, the older it gets the more likely it is that the indent will remain or slowly bounce back. It should of course smell fresh, the more it smells like fish the older it is. The fresher it is the less unpleasant aroma there will be. The above presumes you are allowed to smell and touch prior to purchase otherwise you must rely on the supplier and maybe the use by date if packaged. A pleasant aroma (someone once wrote that, fish should smell of the sea, be briny in aroma . . . by the time it smells of fish it is too late). Plentiful scales that are not dried up. The body being covered in sea slime.